I’m sure we have all seen a diagram of our Solar System where all the planets circle the Sun and their orbits are all in one flat plane. If this were true, then during every orbit, the Moon or Venus or Mercury would pass between the Earth and the Sun. Of course, the real world (or universe) isn’t like that and even though the orbits are tilted by just a few degrees, the distances involved mean that the planets usually pass above or below the Sun when viewed from Earth. However, very occasionally an alignment occurs and a planet crosses the face of the Sun in what is known as a transit. Transits of Mercury happen about 14 times each century, in May or November. I managed to observe one in 2003 for a few minutes just before I had to go to work (what?). The last one was in 2006 and the next one will be in November 2016, during the afternoon of May 9th. Transits of Venus are more infrequent, occurring in pairs eight years apart, every one hundred years or so. The first of the most recent pair happened in 2004 and we have the second one this month. Unfortunately it starts at around 11pm on June 5th and lasts until just before 6am on the 6th. The Sun rises just before 5am, so it should be visible for an hour or so, including the time taken for the planet to slide off the face of the Sun. Now, I have to point out that you should NEVER EVER look at the Sun, especially through any optical device! The only way to see the transit is by projecting an image of the Sun on to a screen (a sheet of paper will do) using a telescope or even binoculars. 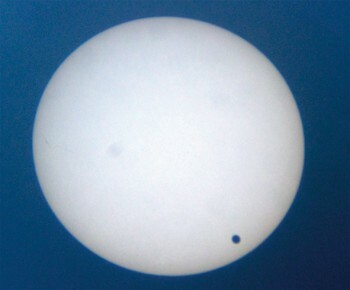 I managed to photograph the 2004 transit (above) using this method and the telescope of a rather well known astronomer. You can see the perfectly round silhouette of Venus, much darker than any Sunspot. If I can find a decent view of the north eastern horizon, I will have a go at this one too. When the Moon transits the Sun, we get an eclipse and this happens about twice every year, mostly where no one can see it! The Moon is more interesting this month because when it is full, it doesn’t rise far above the horizon and so always looks bigger than at other times of the year. Look out for it on the 4th or a day or two either side, especially just after it rises (about 9.40pm on the 4th) and see if you can work out why this may be – it‘s not due to any magnifying effect of the atmosphere. Mercury is visible all this month but is at its best from the 10th onwards. Look for it as soon as the sky darkens, in the sunset. On the 21st it will be just above a very thin crescent Moon. Later in the evening, look out for Mars below Leo, low in the south west. It still looks very red although not so bright now. During the course of the month, it will wander over towards Saturn, to the left or south. Saturn is still very bright and fairly easy to spot and on the 26th to the 29th, the Moon passes close by.